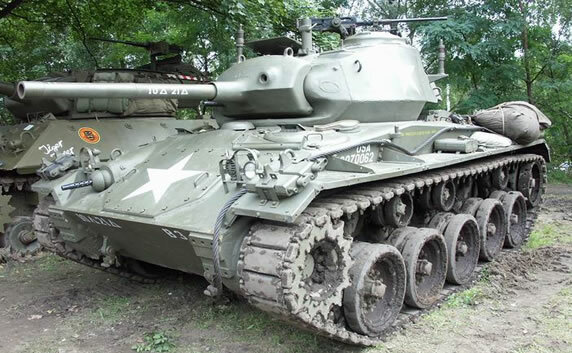 The US M24 Chaffee Light Tank was the last of the Light Class Tank developed and manufactured by the US during World War 2. It was a fresh design as a replacement to the M5 as the vehicle had proved somewhat unreceptive to the much required up armament from a 37mm to a 75mm main gun. Trials for the vehicle started in late 1942 as the T24 and in 1943 an order for 1000 vehicles was made, when in May 1944 it was designated the M24. The vehicle was manufactured by GMC’s Cadillac Division and Massey Harris Company, with first deliveries reaching the European Frontline in November 1944 where they replaced the M5 in US service. The UK also received the vehicle during the War, who named it after General Adna R Chaffe, founder of the Armoured Force. The vehicle used a 75mm Main Gun which had a recoil system, permitting such a large gun being used in such a small turret. 48 rounds were carried. It had a coaxial 7.62mm MG, a further 7.62mm bow MG mounted in the front of the hull and a 12.7mm MG mounted on the roof of the turret. The hull had a sloped frontal steel armour as well as the turret with a maximum 38mm thickness. It used 2 Cadillac V-8 engines giving a top road spped of 55km/h and operational range of 281km. There were a number during the War, M37 & M41 Howitzer Motor Carriage, M19 Gun Motor Carriage, Anti-Aircraft Tank and T38 Mortar Carriage. Not only serving with the British and US during World War 2, the US operated the vehicle during the UN Lead Korean War where it proved susceptible to the Russian T-34 operated by the North Korean’s. The vehicle was sold on to various other nations after it was withdrawn in the 1950’s from US service. Norway – 123 entered service in the 1950s, last Chaffees were taken out of service in 1993. Republic of Korea- 30 Chaffees were used for Training in the early 1950s. They were later given to ROC Army.